What Are the Benefits of Passion Flower for Menopausal Women? Can I Take 5-HTP With Effexor? What Herbs Interact With Paxil? Paxil, a brand-name version of paroxetine, belongs to a class of medications called selective serotonin reuptake inhibitors (SSRIs), which are used to treat depression and anxiety disorders. Taking Paxil with herbal supplements may result in harmful interactions, including serotonin syndrome, a condition that can cause confusion, hallucinations, coma and death. Consult your doctor before taking dietary supplements with Paxil. 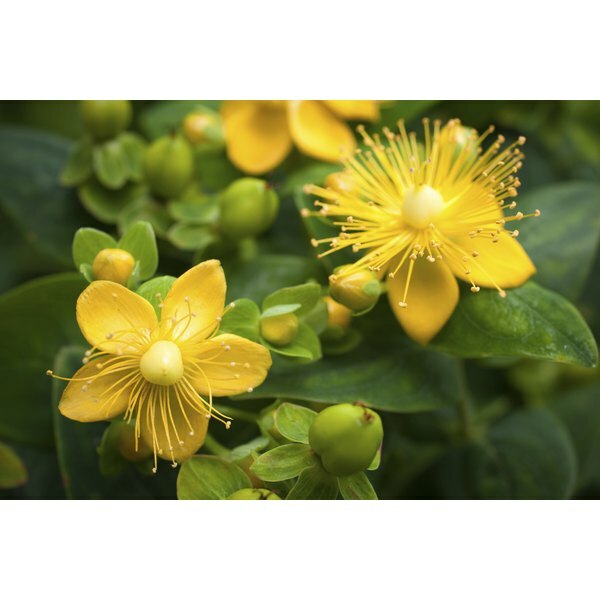 Paxil and the popular herbal supplement for depression, St. John's Wort, or Hypericum perforatum L., are both serotonergic agents that affect serotonin. Concomitant use of serotonergic medications like St. John's Wort and Paxil can cause too much serotonin in the brain, resulting in the potentially fatal condition serotonin syndrome. St. John's Wort may also have potentially serious interactions with a number of other conventional medications, including other antidepressants and anxiety medications, adrenergic vasopressors, anesthetics, oral contraceptives and many others, according to a systematic review published by "Drugs" in 2009. Made from the seeds of the African plant, Griffonia simplicifolia, 5-Hydroxytryptophan, or 5-HTP, is another type of herbal supplement used to treat depression. Like St. John's Wort, 5-HTP increases serotonin and should thus be avoided while taking Paxil, as using both at the same time may cause a dangerous interaction, i.e., serotonin syndrome. The same is true of any dietary supplements containing the 5-HTP-related amino acid, tryptophan. MedlinePlus advises against using 5-HTP altogether -- even if you don't take antidepressants -- as some people who have taken it have developed a serious condition called eosinophilia-myalgia syndrome, or EMS. Ginkgo extract, made from the dried leaves of the Ginkgo biloba tree, is one of the best-selling herbal supplements in the United States, according to the University of Maryland Medical Center; however, it may also interact with Paxil and other SSRIs by increasing risk of serotonin syndrome. Additionally, there are indications of drug interactions between Ginkgo biloba and other types of antidepressants, including MAO inhibitors and trazodone, as well as anti-seizure medications, anti-hypertensive medications, diuretics, blood thinners, diabetes medications and cyclosporine, according to UMM. Kava, or Piper methysticum, is an herb that may be useful in the management of anxiety; however, the U.S. Food and Drug Administration warns against using kava supplements as they have been associated with cases of severe liver damage. Moreover, kava may interact with paroxetine, according to the above-mentioned 2009 "Drugs" review on herbs and prescription medication interactions. Other medications with which kava may interact include certain Parkinson's drugs and the anti-anxiety medications alprazolam and levodopa. The National Center for Complementary and Alternative medicine also warns that using kava may cause yellow, scaly skin. Shannon George, former editor-in-chief of the trade magazine "Prime," holds a Bachelor of Arts in English from San Diego State University. Her health interests include vegetarian nutrition, weight training, yoga and training for foot races. Why Can't Diabetics Take Yohimbe? What Are the Health Benefits of Kava Kava? Can I Take Valerian Root With Lexapro? Can L-Tyrosine Be Used With Prozac?